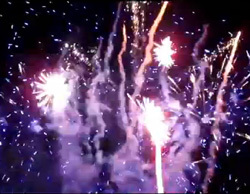 Chris Evert - legendary US tennis star hosts a surprise firework display for her friend Pam Shriver's 50th birthday. With Andy Murray, Roger Federer, Novak Djokovic and others producing their fireworks at the All England Tennis Club, the Americans were not to be out done, so for their 4th July US Independence Day, Chris Evert had high hopes for a spectacular firework show. Guests included other great US tennis stars, including Martina Navratilova and Tracy Austin.